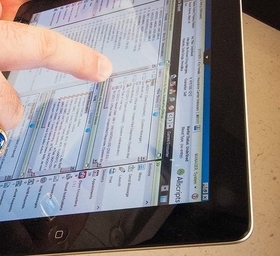 A physician uses a tablet to review patient diagnoses and symptoms logged in an EHR. Allscripts booked less business in the second quarter of 2018 than it did during the same period of 2017, with a decline of 32% year-over-year. The biggest hit was to client services, while booked business in software delivery remained relatively flat year-over-year. But the company had a strong quarter in terms of revenue, with its numbers shooting up 23% over 2017 to $536 million. The Chicago-based electronic health record vendor has spent the last year snapping up other companies. In the fall of 2017, it acquired the health IT division of McKesson for $185 million, and in early 2018, it acquired EHR vendor Practice Fusion for $100 million. Then in May 2018, it closed a $60 million deal to acquire patient-engagement software company HealthGrid. With the McKesson health IT acquisition, Allscripts doubled its EHR footprint in U.S. health systems and added revenue cycle, lab analytics and content-management tools. Aside from spending on acquisitions, the company has also been sinking money into research and development, with expenses in the category up 51% in the second quarter of 2018 compared to the second quarter of 2017. That money is going to research and development "across the global healthcare IT spectrum," Allscripts CEO Paul Black said.